The Board of Thor Mining Plc (“Thor”) (AIM, ASX: THR) is pleased to announce that the Company has confirmed extensive tungsten mineralisation (including high grade zones) from the first stage of exploration at the Samarkand deposit, one of thirteen known tungsten deposits within the Bonya project. The Bonya tenement is held jointly (THR; 40%) with Arafura Resources Limited (ASX: ARU; 60%) adjacent to the Molyhil mine project in the Northern Territory of Australia. 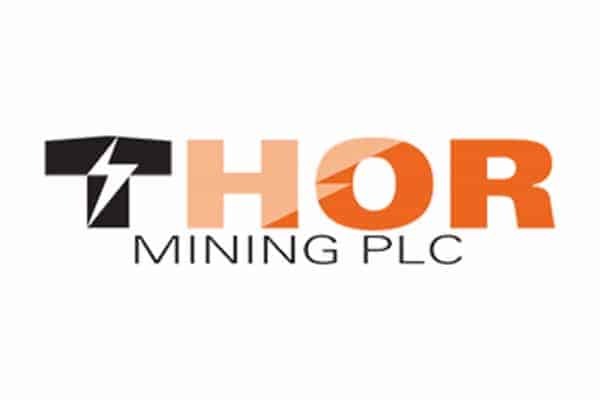 Thor Mining is the joint venture (JV) operator. · Samples collected via systematic sampling program, in December 2018, from trenches excavated across the deposit more than 40 years ago. · Deposit outcrops at surface extending more than 500 metres and is open ended. · The proposed drill programme will enhance our knowledge of the extent of mineralisation and is an important next step for the Bonya project. Samarkand is one of several tungsten deposits within the Bonya Range and is located approximately 350km ENE of Alice Springs and approximately 30km east of Thor’s 100% owned Molyhil deposit. The geological setting of the Samarkand tungsten deposit comprises steeply north east dipping meta-sedimentary rocks of the Kings Legend Amphibolite formation with multiple local pegmatite intrusions. Tungsten mineralisation is typically coarse grained occurring as discrete scheelite crystals dispersed preferentially within select lithologies within the formation. The rocks are interpreted to have been hydrothermally altered during the mineralisation event, and then strongly regionally metamorphosed to amphibolite grade. Continuous channels of chip samples were collected along historically excavated bulldozer trenches cross cutting the zone of mineralisation. One metre interval samples were collected by hand using hand tools and where necessary assisted with diamond saw. All sample locations were photographed and GPS locations recorded for channels end points. The historic channels provided good in-situ rock exposures for an estimated 60 – 70% of the entire mineralised sequence. As some parts of the mineralised sequence were not exposed and not adequately sampled, the samples are therefore not considered suitable for future resource estimation. 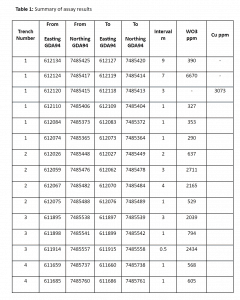 An additional 20% QAQC samples were inserted comprising certified standards, blanks, field repeats and splits. All samples were sent to NAGROM laboratory in Perth for assay. The samples were sorted and dried. Primary preparation involved weighing and crushing the whole sample. A subsample was split off for pulverising to produce a sub 75µm pulp for analysis. A sub-sample of each pulp underwent a mixed four acid digest with an ICP – OES/MS analysis. All samples with initial assay results exceeding 200 ppm tungsten underwent subsequent peroxide fusion digest with ICP – MS analysis. Internal laboratory QA uses CRM’s, blanks, splits and replicates, along with 10% repeats.